This is the Conservation Plan for Highgate Cemetery. (26MB pdf) The plan has been prepared by a leading multi-disciplinary consultancy, Alan Baxter Ltd, and so it benefits from their considerable knowledge and experience. We consulted members, volunteers and the public about what the plan might include and the plan responds to that consultation. The resulting document sets out the history and significance of this special place, and explains how we propose to look after it in the future. Trees of the most suitable species in the most suitable places and in good health will make it easier, and safer, to appreciate the quality of our historic landscape. Furthermore, not only will they be less likely to damage memorials, this will be better for biodiversity too. In addition, we would like to reveal many of the memorials currently hidden by ivy, and to restore the more important of them so that future generations will be able to appreciate them as we do. We would also like to return our chapel and its setting to its proper appearance, especially by reinstating the chapel’s lost cupola, pinnacles and finials. A closed cemetery is a dead cemetery, so we will investigate how we can continue to provide for the burial needs of current and future generations. This could involve reclaiming grave space which has never been used, or re-using graves that are no longer wanted, or creating additional spaces for cremated remains in columbaria and attractive garden settings. All of this can be knitted in carefully and respectfully to our wonderful historic environment. We are keen to improve the visitor experience, from sharing our acquired knowledge of the Cemetery and who is buried here, to helping people find their way around better on site. We propose to explore the opening of the West Cemetery for free-flow visitors in addition to our excellent guided tours. We would also like to provide better displays and interpretive material, as well as the creature comforts everyone expects nowadays: some food, drink and adequate toilets. All this can be done while preserving the essential character of the place. We believe that evolution rather than revolution is the way forward. The next step will be to develop an implementation plan. This will set out how we intend to prioritise and deliver the actions set out in the conservation plan. This plan will be determined by a number of factors, including our ability to secure the necessary funding. We anticipate that we may also need help from the National Lottery Heritage Fund and private donors, as well as a new Act of Parliament if we are to manage our burial space more effectively. Highgate Cemetery is one of the world’s finest garden cemeteries, and the policies in this Conservation Plan are intended to help keep it that way. Highgate Cemetery has been in use as a cemetery for 179 years and has now reached a point where important decisions need to be made about its future. Burial space is running out and maturing trees are destroying graves and memorials. Doing nothing is not an option. We have commissioned a conservation plan to guide the future of the cemetery. The purpose of a conservation plan is to make sure that when you make changes to a place, these changes should not only maintain but enhance what is special about it. The conservation plan should be completed by the end of this year and there will be a public consultation on the final draft plan before it is adopted. Alan Baxter Ltd, our consultants, produced a draft Initial baseline study in June 2017 to summarise their current understanding of Highgate Cemetery. In June-July 2017 we held an exhibition at the Cemetery and online entitled Highgate Cemetery at a crossroads. We invited visitors to complete a questionnaire either on paper or online. The numerical results are collated here. Then followed a draft Options Report which set out the main strategic issues facing Highgate Cemetery, as well as some options for each of the character areas identified. We have put these documents online so that you can see some of the process which has informed our thinking. But please do bear in mind that the drafts are just that. 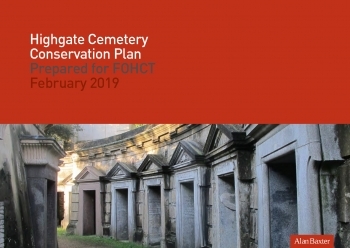 There will be a formal opportunity to comment on the full conservation plan, but should you wish to make any comments on these documents, please email info@highgatecemetery.org. Our consultants are now working on the draft full conservation plan. It will contain the policies which will guide our management of the Cemetery into the future. We will post the draft on this website in June and invite comments on it. Once those comments have been reviewed and any required changes incorporated, the conservation plan will be adopted as policy by the trustees. The next stage will be implementing the policies set out in the plan. George Michael's grave is in a private part of Highgate Cemetery which is not accessible to visitors. Friends should contact the family for access. Tributes should not be left at the cemetery as there is no space to receive them. George Michael's grave will not be visited on tours of Highgate Cemetery. Some fans have asked how to make a donation in memory of George Michael. If you would like to donate to the Friends of Highgate Cemetery Trust, the charity which cares for Highgate Cemetery, please click the donate button. The Friends do not make a profit because they reinvest their income to maintain and enhance the cemetery. 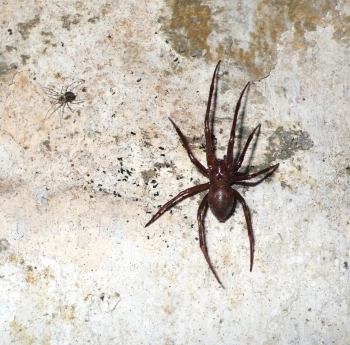 A large, rare spider has been recorded for the first time in London — deep in tombs at Highgate Cemetery. As part of the Wild London Inclusive London project, staff at London Wildlife Trust have been working with the staff and local community of Highgate Cemetery since last summer. During a bat survey in December, Trust staff came across a population of large spiders in the vaults of the Egyptian Avenue at the Cemetery. Interestingly, these orb weavers are the species Meta bourneti, the rarer of two species of Meta (Britain’s largest orb weavers). The identity of the spider was confirmed by Edward Milner, Spider Recorder at the London Natural History Society — and it is the very first record of the species in London! Meta bourneti is particularly fascinating because, due to its origins as a cave-dweller (also known as a cave spider), it requires total darkness. Even an outdoor night time environment is too bright for it, so the spiders never leave the tombs. A sealed vault, on the other hand, provides a perfect breeding ground. Most of these vaults - walk-in tombs designed to house around four coffins — have not been opened for several years. And, because the structures date from the late 1830s, it’s quite possible the spiders discovered have lived in the tombs for at least 150 years without being detected. The find is made even more exciting by the spider’s large size. Most new spider records are for tiny species, but Meta bourneti measures over 30mm in diameter with leg-span included. Meta spiders are amongst the largest spiders found in Britain. In addition, the size of the population at Highgate Cemetery is substantial: A very rough initial estimate puts the number of adults at as many as a hundred. More research will now be carried out. During the various species surveys recently undertaken at Highgate Cemetery — and with the help of several expert specialists — London Wildlife Trust staff have discovered 227 species previously unrecorded at the site on London’s environmental records centre, Greenspace Information for Greater London (GiGL). Meta spiders prey on small insects and woodlice. The females produce teardrop-shaped eggsacs, which hang suspended on a silk thread from the roof of their dwelling. When the spiderlings first emerge they are attracted to light, unlike the adults which are strongly repelled by light. This helps the spiderlings find new areas to colonise. Meta bourneti also need constant temperatures and high levels of humidity. Elsewhere in the UK, these spiders can be found in sewers, old cellars and abandoned railway tunnels. Thanks to the London Wildlife Trust.